Image caption Mr Cameron says he hopes to settle the question of the UK's position in Europe "once and for all"
David Cameron is to make his long-awaited speech on Wednesday on the UK's relationship with the European Union. Commentators and politicians have offered the prime minister their advice, reflecting on the prospect of a referendum after the next election, the benefits of life inside and outside the EU and divisions within the Conservative Party. Here is a round-up of what they have been saying. Writing in the Times, former Labour foreign secretary David Miliband warns that the UK cannot afford five years of "suspended animation" and that referendums are often "boltholes for leaders who feel weak". "The rest of Europe does see the value of Britain being on the inside and will go some way to accommodate us. "But the absolute prerequisite is that they must believe we want the enterprise to succeed. They will not concede points to us because we hold a gun to their heads." James Forsyth, in the Spectator, says the speech may end up leaving the Conservatives "more deeply split" than at any time since the repeal of the Corn Laws in the 1840s. "As soon as Cameron has sat down after his speech - and probably well before he stands up to deliver it - a Tory row over Europe will erupt," he writes. "The 'Better Off Out' crowd will denounce him. MPs and donors will be spitting at the prospect of the party campaigning to stay in the EU in a referendum. "Many MPs will complain that with the UKIP threat looming, the Tories have no chance of winning a majority without some kind of referendum in this parliament, even if only one seeking a mandate for renegotiation." The ConservativeHome website, which is popular with grass roots activists, urges Mr Cameron to commit to three things: to renegotiate the UK's relationship with Europe, to put the outcome of the negotiations to a public vote and to reassure the public that a referendum will be held by introducing legislation before the next election. "Cameron has a huge opportunity in his speech on Friday," its editors write. "He has an opportunity to demonstrate he understands the challenge facing the European economies and the European social model. "He also has an opportunity to park the European issue within domestic politics so that his government can focus on the immediate economic challenges as well as the NHS, welfare reform and other projects close to his heart and to the hearts of voters." But they warn "if he gets it wrong he may find that it is increasingly difficult for him to maintain the confidence and unity of the Conservative Party." Ian Davidson, in the Financial Times, says the push for a more federal Europe may render Mr Cameron's views "immaterial" . "After all these many years of British foot dragging, Mr Cameron's options are so severely constrained that he faces a stark choice: fall in with the strategic preferences of Germany and France or drop out." Writing on his blog, Conservative MP Douglas Carswell contemplates life outside the EU, suggesting it would lead to higher living standards, a more competitive economy, a greater share of global trade, more democracy and more dispersal of powers. "Leaving the EU does not mean returning to some imaginary past," he argues. "It means far reaching change for the better." The Economist considers whether Mr Cameron will be able to plot a "middle way" between those with seemingly irreconcilable opinions on the issue. "That the speech has taken so long to materialise reflects the sensitivity of its subject," it observes. "Mr Cameron is trapped. On the one hand, Labour, the Liberal Democrats and most of the business community are broadly in favour of Britain's membership of the EU. On the other, a mostly eurosceptic Conservative Party is hostile. "Some reckon that a third pole is emerging: in favour of continued membership of a drastically reformed, more economically liberal (read: more British) European Union. Others reckon that such aspirations are for the birds." In his Daily Telegraph blog, Benedict Brogan suggests Mr Cameron's aim is "to keep both sides unhappy and tilt for the middle". "His betting is that a majority support his objective, which is to make real William Hague's ideal of a "Britain in Europe, not run by Europe. "He wants a renewed relationship, with powers repatriated, and he wants that new arrangement to be given consent in a referendum. victory in the general election of 2015 would provide the mandate for negotiation." In the New Statesman, George Eaton ponders whether Mr Cameron would allow members of his cabinet to campaign on different sides in a future referendum. "The last time Britain held a referendum on the EU in 1975, Harold Wilson took the unusual step of suspending collective cabinet responsibility in order to allow his ministers to support either side in the campaign," he reflects. "Expect Cameron to be asked as early as Friday whether he would allow Conservative cabinet ministers to campaign for exit." It is not only David Cameron who is under pressure to set out his stall, says the Daily Telegraph's Mary Riddell. "In the face of Tory disarray, Labour feels oddly silent," she writes. "Ed Miliband may believe he can sit back while the Tories indulge in internecine war. 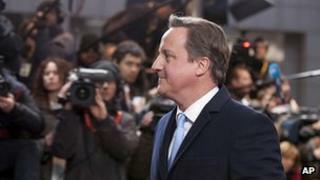 An electorate spooked by Europe and immigration is unlikely to accord him the luxury of time." Writing in the Guardian, Simon Jenkins questions the level of public interest in the whole issue. "The stupid Euro questions refuse to go away. Are you in favour of Europe? Do you want to leave Europe? Do you want an in-out referendum? Do you want to be Switzerland or Norway? "They stumble on through a storm of cliches, about sleep-walking, club members, departure lounges and minutes to midnight. The brain softens. The public screams, then it yawns."